Twisted Staff picks up after Serafina has defeated the man with the Black Cloak. Only peaceful for a short time, Biltmore has a new threat, but Serafina doesn't know who the main suspect could be. From the first book, Serafina doesn't change at all. Maybe a bit more mature, she is still the adventure-loving, amber-eyed girl who loves being CRC (chief rat catcher). Now out of hiding, Serafina can (although she rarely does) roam the Biltmore grounds freely. She has become good friends with Braeden, the Vanderbilt's nephew, and she and her father have developed an agreement, if not a friendship, with the owners of the grand estate. But the routine is short lived as Serafina must figure out who is causing a new danger in her home. Who does the Twisted Staff belong to? What does it want? What is its purpose? Can she trust anyone besides the people she's known for her entire life? There are several new characters in the sequel, and Serafina is wary of all of them. Lady Rowena is visiting the estate while her father is working, and she has befriended Braeden, much to Serafina's dismay. While Braeden must show Lady Rowena around, he has neglected to spend much time with Serafina. When Serafina and Lady Rowena first meet, the tension is palpable, and they will not easily get along. The second new character is Detective Grathan, who shows up to investigate the death of the Man in the Black Cloak. Serafina doesn't trust him and all of his questions. The final new character who could be a suspect is the old man whom Serafina sees while she's in the forest at the beginning of the book. 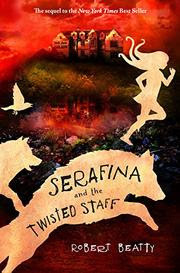 With a grey beard and twisted staff, Serafina is threatened by this man and forced to survive very early in the book. Not every new character is suspicious, however. There are two other characters that I will let you read about on your own who are very sweet and help Serafina when she needs it most. One is even a possible love interest in future books (hopefully!). Needless to say, I haven't been this excited about a book series since Harry Potter. Beatty delivers so much fast-paced action that it's nearly impossible to stop reading. The characters are multifaceted gems, ones you rarely find in children's literature and ones that you hope will continue their adventures. Being born and raised in the South, I applaud Beatty as he defines so many elements of southern, "country" living while also painting a magical world alongside the history of Biltmore. I can hear Serafina's father's dialect in my own family, and it makes the entire book feel like home. It is not easily done, but Beatty has crafted a new series that will remain with young readers (and adults alike) for many years to come.